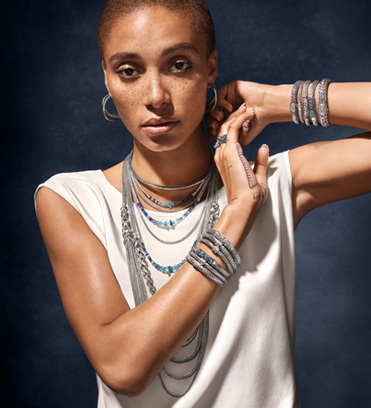 John Hardy is proud to introduce our second Made for Legends campaign–dedicated to the empowerment, inspiration and individuality of the women who wear our designs. Calling on our cherished connection to the earth and its gifts of energy, organic stones and fine metals, it places a special emphasis on the power of transformation that our jewelry offers. As the stones journey from raw element to artful creation in the hands of our Balinese artisans, our wearers journey from the point of purchase to bold stacks of bracelets that radiate with individualized, creative styling. An inspired creator. A soulful renegade that forges her way forward. A symbol of empowerment. A fearless woman who is perfectly imperfect. She rejects the suggestion that one should be gifted jewelry and instead, she celebrates her successes, life changes, style and simply herself, by acquiring dynamic pieces to transform into whatever she desires–from dramatic statement looks to energetic, everyday style. John Hardy creations are all one-of-a-kind pieces that are handmade at our workshop in Ubud, Bali using sustainable materials and techniques passed down from generations of master artisans. The alchemistic, raw energy infused into each sustainably made piece is reflected in the beauty and magnetism exuding from the legends who wear them. 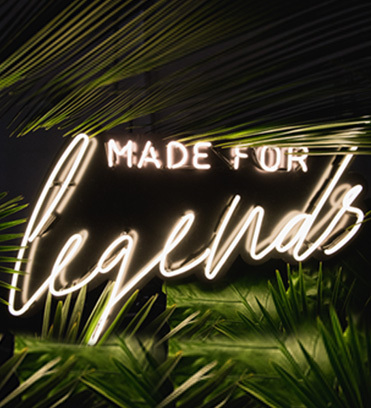 A legend is...you. Campaign star, muse and activist Adwoa Aboah is the perfect embodiment of our creative vision. Her cheeky confidence and eclectic style create a striking aura that fueled our creation of the campaign. Adwoa is drenched in layers and stacks of Classic Chains, vibrant power rocks and the new Asli Chain–and the captivating way she wears these looks evokes a powerful confidence that we want every woman to feel. The root of the campaign is the ability to make these dynamic styles your own. Perhaps the signature styling option of John Hardy, stacks of our chain bracelets are a captivating and wholly-customizable look for any woman. With different chains symbolizing different personal milestones or events (a promotion, a move to a new city, a simple gift to oneself on a rainy day), your stack is entirely unique in both its one-of-a-kind makeup and its personal significance to you. The options expand beyond stacking with vividly hued stones that flow over elemental designs like rings and earrings, or a bib necklace with interchangeable links that allow for adjustable lengths from choker to opera length. The Made for Legends campaign champions empowered, daring women evocative of fearless momentum, with Adwoa Aboah perfectly fitting the bill. Using the iconic John Hardy chain as a centerpiece, we invite women to embrace the transformative power and creative expression of jewelry.